How cool are these bracelets? I love...love...love them! I was beyond excited when Claudia Rowe agreed to collaborate with me. I get all giddy when I find a new designer! She has wonderful pieces that are unique and oh so trendy! She launched her line just this year and has already made a name for herself! She combines base metals in gold, brass, and silver plating with crystal, druzy, and cording accents. She also has these darling interchangable charms to choose from that add to her colorful wrap bracelets. I will definetely be adding these to my arm!! they layer so nicely. Claudia's inspiration for her line comes from the unique charms and trinkets her mother collected during her travels when she was a child. 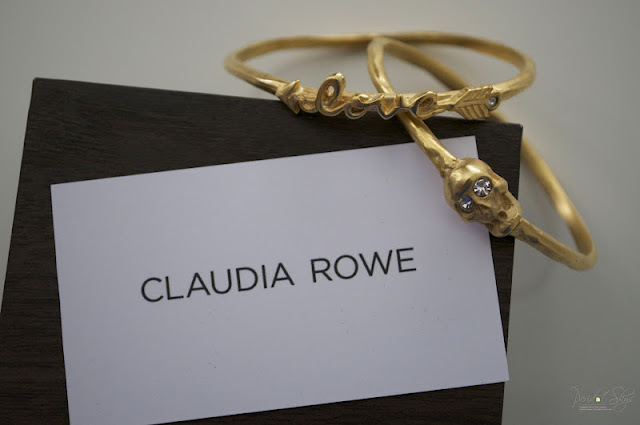 The casual chic aestetics of the Claudia Rowe collection are inspired by the eclectic charms mixed together. Claudia designs for fashion forward woman who enjoy layering their jewelry to create a personalized look. What girl doesn't love to layer her arm with jewels, and create her own look? I know I do! The mixture of metals and different designs makes these bracelets perfect for everyday wear. I wear my bracelets with every style of outfit and layer them with my other bracelets too! You knew there was something fabulous waiting for you to win didn't you? 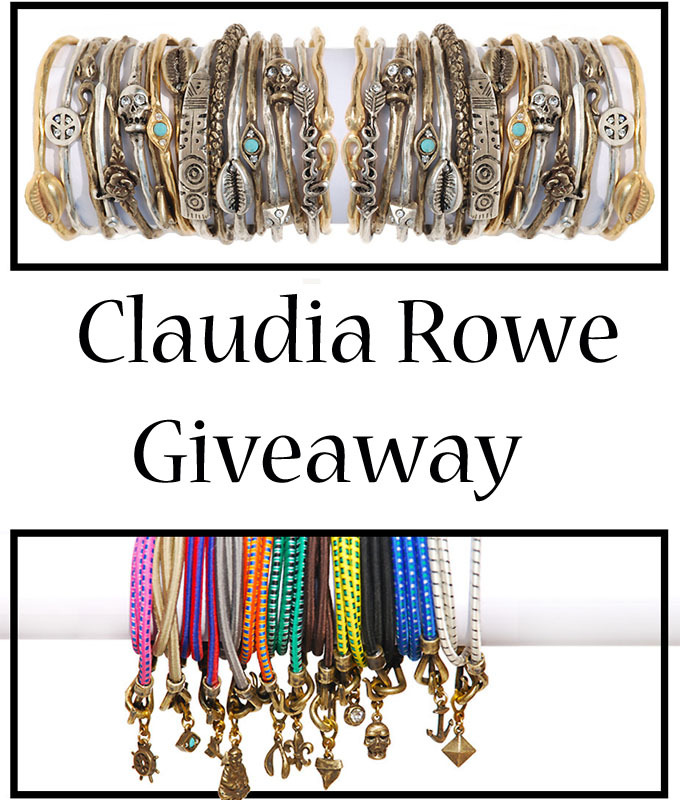 Enter to win a Claudia Rowe skull bangle just like mine to love and cherish! Maybe cherish is a strong word here........... umm no, I cherish mine! Follow the instructions in the rafflecopter form to enter to win! Remember, follow the rules, I will be checking! Good luck! The 'love' bangle is my favorite! Thanks again for the intro to a fabulous jewelry designer! I love the bungee cord bracelets. 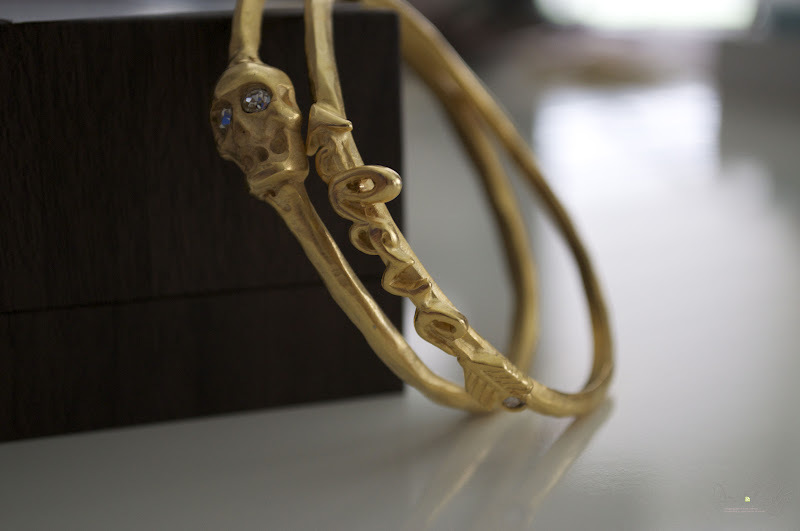 And I adore the skull bracelet you are giving away!! I have to have the "love" bangle!!! I love the Love arrow bangle and the Brown Bungee bracelet! I wish I had the "love" bracelet! The Love Arrow Bracelet is my fav. I LOOOOVE the Noblise necklace! !